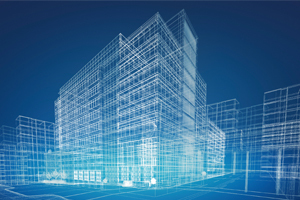 Today’s complex buildings require cutting edge engineering to optimize performance efficiency. Computer Aided Design and Drafting (CADD), facilitates coordination and planning for the most complex projects. It is used to reduce or eliminate workflow issues during the planning stage, ultimately saving time and money during construction. Additionally, this tool is used for cost estimates and production of detailed drawings for construction. CADD is integral to delivering a streamlined project. Project Drawings and Building Information Modeling (BIM) are fused to work out any coordination issues and conflicts between mechanical, electrical, structural, and plumbing systems before construction begins. This coordination can help ensure that projects that are delivered on time and within desired budget. At Danforth, our CADD department is a driving force for our project planning process. Working in conjunction with other Teams within our company, as well as other contractors, our CADD Team can provide images and data that are key to decision making and coordination on a project. Using state-of-the-art tools such as Autodesk NavisWorks software, Trimble TSI automated field dimensioning and 3D modeling; we are able to virtually create your project in 3 dimensional renderings, which leads to streamlined project delivery. Start Your Computer Aided Design and Drafting (CADD) Project with Danforth. Meet with one of our Computer Aided Design and Drafting (CADD) consultants. We’ll outline our process and begin your project estimate. Need More information? Send us a quick message and we’ll reach out to you to help plan your next CADD Services project. Get answers about our Computer Aided Design and Drafting (CADD) services and speak with a knowledgeable Computer Aided Design and Drafting Expert.